All of the above materials have the appearance of cotton wool when manufactured. They are white with fibres forming a light fibrous mass or wool. Due to the nature of the fiberisation process, the wool contains fibres with a range of various lengths and diameters. 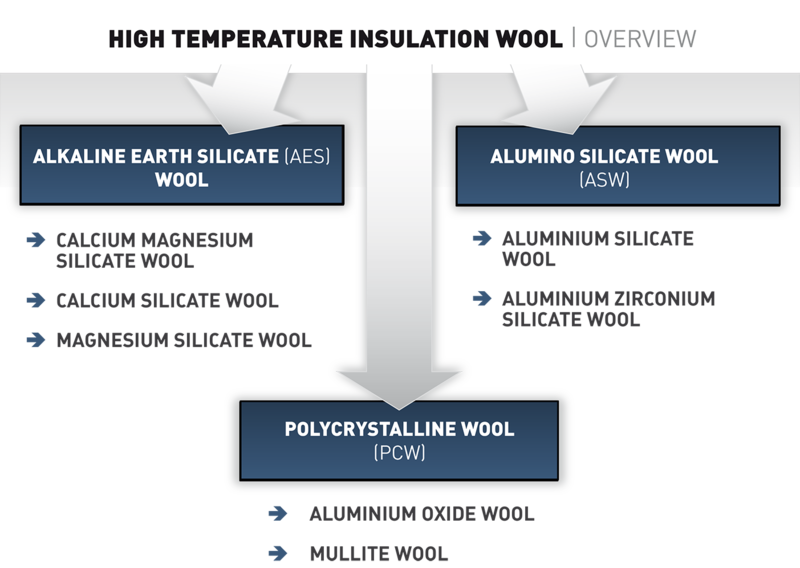 Bulk/Wool: The cotton wool-like material collected after fiberisation – is sold as feedstock to other processes or for some minor uses. Blanket: A mat of wool is converted to a blanket by „needling“. Pushing barbed needles into the mat and withdrawing them produces a coherent blanket. Blanket can be stacked or folded and compressed to produce modules. Modules: Retangular blocks ready for installation, for example, along furnace walls. Some modules have more complicated structures. Board: Rigid composite board containing a variety of organic and/or inorganic fillers and binders. Paper and Felt: Flexible composite often containing latex as a binder. Vacuum-Formed Shapes: Articles sometimes with complex shapes produced from wool mixed with fillers and binders in an aqueous suspension. They are then drawn into forms or moulds by vacuum where most of the water is removed. After further drying and finishing they can be supplied ready for installation with minimal further processing. Cement and Mastics: Sold as mixes or as mastics ready for installation. Textiles: Cloths, threads, ropes and yarns. A small proportion of HTIWs is converted into these forms for specialised applications.